Final Week! Corgis, Dachshunds, & Bassets at $100K! Home Free is coming to steam! Greenlit 10/30/2015! Home Free is coming to PS4! Choose one of the PS4 reward tiers to reserve your copy! FULLY FUNDED IN 5 DAYS! THANK YOU, BACKERS! We still have plenty of fun stretch goals to reach. Please keep spreading the word! You are a dog, lost in a sprawling and unfamiliar city. You wander the streets, searching for scraps, for shelter, for a friendly face. Slowly, you overcome some of your fears. You learn where you can snag a meaty bone, where you can sleep warm and safe at night. Strange streets become familiar territory. One by one, the streets become yours. You find friends. Eventually, maybe, home. Home Free is an open-world action-RPG starring a dog lost in a sprawling, randomly generated city. Use your canine abilities to explore this strange, sometimes hostile environment and find your place in the world. I've been working on Home Free for about two years now, and I'm very excited to show you where I've taken it so far. This project is the culmination of a lot of work and a bunch of crazy interests: procedural content, urbanism, quadrupedal locomotion, and dogs -- how they play, the stories we tell about them, and what makes them tick. Player-driven narrative. Shape the story of one dog's survival through your choices and actions. Experience the the world from the perspective a creature who will never quite understand why that world acts the way it does. Wrestle, wriggle, and pounce. Home Free features a full range of canine moves to master, whether you're playing with friendly dogs in a local park or escaping the aggressions of territorial dogs in a dark alley. Learn the unique rhythms of your city. Which neighborhood has the tastiest garbage just after sunset? What park empties at mid-day so you and your dog friends can have a fun romp when no one's around? Dog it up with your friends in real life! Home Free comes bundled with my local multiplayer dog wrasslin' game, Dog Park, included at all backer levels! A dog is always hungry. To survive in the big city, you'll need to decide how best to satisfy your doggy hunger. The city is noisy, crowded and surprising, built for two-legged creatures whose ways are hard to understand. Some seem friendly. Can you get them to share their food? Others run screaming when they see you. Maybe they want you to chase them? Some attack on sight, with hands and sticks and boots. What’s your best escape route? Noisy metal boxes fly by in unpredictable patterns. Are you fast enough to dodge them? It’s their city, but you can still master its streets. A time lapse of the city generator at work. Every game gets its own unique city. No strategy guides or FAQs will help you here. You are truly lost. All trailer footage was captured in-game from a pre-alpha build of Home Free. Home Free is a beautiful, heartbreaking single player experience, but it also comes bundled with a raucous multiplayer mode: DOG PARK! Dog Park is a 4-player, local multiplayer dog wrasslin' game, and it comes with Home Free! Become a dog as you chase, wrestle, cavort and gambol with other players in a chaotic struggle to have as much fun as you can. The new, improved version of Dog Park included with Home Free will feature a bunch of new game modes, improved controls and physics, as well as all the new dog breeds added to Home Free. Dog Park installed at No Quarter 2014 in New York. I created Dog Park for the NYU Game Center's yearly No Quarter show, and debuted it there in September 2014. Dog Park is a game about my fascination with the dynamics of dog play. Dogs are possibly the world's best game players: they have a huge appetite for play, they manage to negotiate new games with each other without using language, and they seem to play games for the sheer joy of it, not really caring who wins or who loses. Dog Park is my attempt to recreate some of that experience for four humans at a time, in videogame form. The version of Dog Park shown at No Quarter (and at the IndieCade 2014 E-Sports Showcase) was an experimental game about canine play. The "winner" of the game is the dog who had the most fun, and fun comes in many forms: chasing and being chased, wrestling with other dogs, playing king of the hill on a picnic table. The final version of Dog Park, included as part of Home Free, will feature several new game modes that offer new goals and new reasons to unleash your furry fury with three other friends. Home Free features a brand new, original soundtrack composed by Mark Robinson! Mark founded the Teen-Beat record label and has been a member of the bands Unrest, Air Miami, Flin Flon, Cotton Candy, and Fang Wizard. Mark's music is what this game has sounded like in my head since I first started prototyping it over two years ago. If it ever turned into a real game, I knew I'd have to ask him to work on the soundtrack. I had no plan B. It's an amazing feeling to have one of my favorite artists making music for my game, and I'm very, very excited about it. The music in the trailer is a track Mark made just for this Kickstarter campaign. He's already shared some early sketches for songs that will become part of the final soundtrack, and there's so much good stuff in there. Do dogs even like music? I don't know. But I know I already can't imagine Home Free without it. A DRM-Free digital copy of Home Free (including Dog Park), on Mac or PC. 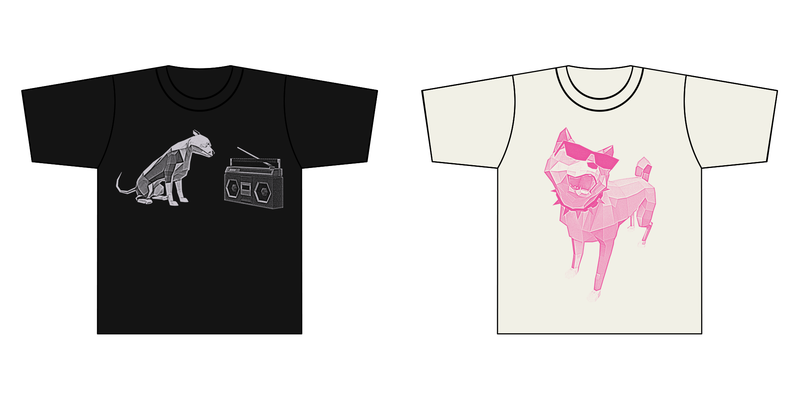 Choose one of two designs (or pick the $95 tier for both) of cool polygonal dogs doing cool polygonal dog things! Send me a photo and I'll use magic to digitize you into an abstract, low-poly human NPC who will play an important role in the city. Includes a few high res screenshots of your digital doppelganger in various poses so you can show off to your friends. I create a fully customized, stylized low-poly playable version of your dog in the game! Just send me some photos, a couple measurements, and a quick description, and I'll interpret your dog as a cartoony, low-poly playable character. Comes with a collection of high res images of your dog in action and in funny poses. Please note the some dogs are more compatible with Home Free's art style than others. If you're wondering whether your dog would be a good choice, message me! I create a custom, playable version of your dog and a custom, NPC version of you. I also create an ultra-exclusive, fully customized ambient minigame experience featuring digital you and your digital companion spending some quality time relaxing alone in the park together. I've been working on this project for approximately two years. Dog Park debuted in September, 2014 at No Quarter in New York City, and was shown again at IndieCade 2014 in the E-Sports Showcase. About a year before work began on Dog Park, I started experimenting with building a procedural city engine. Walking around in this dense, twisty, mysterious place felt great almost immediately, and I kept experimenting even though I didn't really know what I was going to do with it. Home Free is the combination of these two projects: Dog Park provides the dogs, and the city project provides the world you'll explore. At this point, all of that is working well; the trailer was made entirely from in-game footage captured from a pre-alpha build. I've spent my time so far building out the skeleton for Home Free -- an engine that creates vibrant procedurally-generated open world city environments and a system for dog movement, interaction, and control. The fundamentals are now in place, and with your help, I'll spend the next year building out more content, deepening single player gameplay, and tuning controls. Gameplay programming. Flesh out and add content to the game's core systems of exploration, hunger management, and character development. Scenario design. 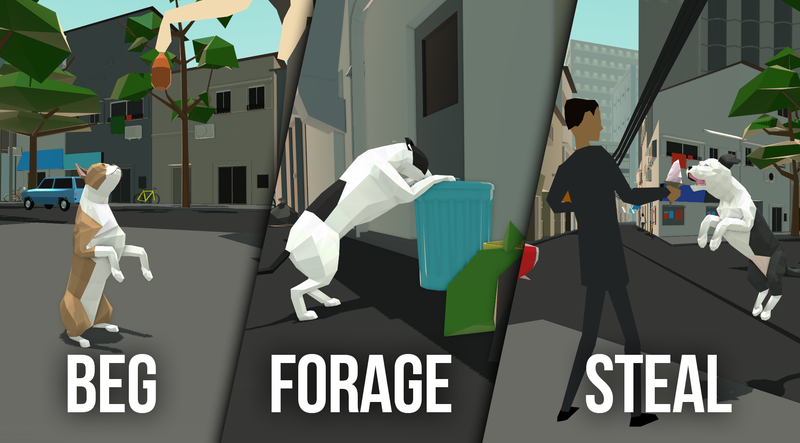 Create semi-scripted situations for the player character to encounter in the world: patrolling aggressive dogs, friendly humans with specific requirements, unfriendly humans, NPC-to-NPC interactions that create opportunities for food and advancement. City content and generator refinement. Create a bunch more city assets to avoid randomly-generated "sameness" problem. Define larger number of "neighborhood" types (currently there are only two) to create more variation and local flavor (similar to "biomes" in Minecraft). Dog modeling and animation. Create at least 5 additional dog body types (maybe more depending on stretch goals and rewards!). Continue building out library of dog behaviors, interactions, and movements. I've brought this project pretty far over the past couple years. I've laid the groundwork for a game I'm excited to play, a world I want to spend time in, and a chance to see that world from my favorite animal's perspective. What I need now is the ability to focus entirely on this crazy idea to see it through to conclusion. So far, all the code, art, animation, and game design has been done by me, on my own. The funds from Kickstarter will allow me to get help on the things I'm not so good at, like music and sound, will enable me to invest in the tools and software I need to make this thing shine, and give me the opportunity to work full-time on Home Free until it's done. Kevin is an independent game developer based in New York. He's been creating games for over 15 years. In 1999, Kevin co-developed Science and Industry, a multiplayer mod for Half-Life, which was featured in Valve's first Mod Expo. For nearly 5 years, Kevin served as Senior VP and Director of Game Development at NYC indie studio Area/Code, where he helped create games like Drop7, Parking Wars, and Sharkrunners. His work has been featured in GDC's Experimental Gameplay Workshop, NYU's No Quarter exhibition, and IndieCade's E-Sports Showcase. He has taught game design and development at NYU and was conference co-chair for IndieCade East 2014. Mark Robinson is an indie-rock musician from Washington, D.C. who started the Teen-Beat record label while in high school. He is a founding member of the bands Unrest, Air Miami, Flin Flon, and currently sings in the a cappella group Cotton Candy and also with Trevor Kampmann (hollAnd) as Fang Wizard. He has released a number of solo records and collaborated with other groups on music projects. Mark's latest project is a film series of interesting retail spaces called STO. All projects come with risks, and videogames have a unique way of combining all the risks of a creative endeavor with all the risks of software engineering. Home Free is no different. The biggest risk to Home Free, as described here, is to its schedule. Software projects sometimes take longer than anticipated, and I want to be honest about that possibility here. I'm helped by the fact that I'm not starting from scratch -- there's over two years' worth of groundwork already laid here. I estimate honestly that another year of steady work fleshing out gameplay, adding content, testing and prepping for release will get me to the finish line. But things go wrong, and I'm only human, so it might all take longer than I want. Another "risk" that's inherent to all game projects is the risk that elements of the design will change and evolve over the course of the project. Game design is an iterative process, and the process of building, testing, playing, re-building, and re-playing has a way of overturning your early assumptions. This is the beauty of game design, but I also want to be clear with you, my backers, that Home Free is a work in progress, and as it gets better and more complete, it will also evolve. I hope you'll want to join me on that journey. I've been making games for more than 15 years. In that time, I've shipped nearly 30 of them. I've applied that experience to the planning that's gone into this project, and I'm going to continue to apply it overcome any of the obstacles I'm sure to face in bringing this project to life. I'm also extremely fortunate to be surrounded by an incredible community of talented game developers here in New York. Their ongoing support gives me confidence I'll be able to tackle whatever challenges lie ahead. DRM-Free copy of the games on PC or Mac. DRM-Free copy of the games plus a set of digital wallpapers for your computer & phone. Digital copy of Home Free plus Dog Park for PS4. Digital copy of the games for PS4 plus a set of digital wallpapers for your computer & phone. All of the above rewards PLUS a digital copy of the original soundtrack by Mark Robinson! PS4 digital rewards PLUS a digital copy of the original soundtrack by Mark Robinson! All of the above digital rewards PLUS a pack of 5 die-cut vinyl stickers of super cute low poly dogs! PS4 digital rewards (games, wallpapers, & soundtrack) PLUS a pack of 5 die-cut vinyl stickers of super cute low poly dogs! Choose one of our cool T-shirt designs. Comes with all digital rewards. Choose one of our cool T-shirt designs. Comes with all PS4 digital rewards (games, wallpapers, & soundtrack). One T-shirt plus a pack of stickers. PLUS all digital rewards! One T-shirt plus a pack of stickers. PLUS all PS4 digital rewards (games, wallpapers, & soundtrack)! Take two T-shirts. Comes with stickers too. And all the digital rewards. Take two T-shirts. Comes with stickers too. And all the PS4 digital rewards (games, wallpapers, & soundtrack). Your dog's name appears in Home Free and Dog Park. Plus pick ONE of our T-shirt designs. Comes with all digital rewards. I model an abstract, low-poly, important human NPC after YOUR likeness. Comes with all digital rewards. I create a *playable* version of your dog for use in the game. See Rewards section for details. Comes with all digital rewards. I create you (as an NPC) AND your dog (for use in game. You also get a fully customized ambient minigame build featuring digital you and your digital best friend relaxing in the park. Comes with all digital rewards.